London is blessed with a wealth of hotels and B&Bs. Yes, we have a great many but they are of variable quality, so it’s always wonderful to find a little hospitality gem. The Georgian House Hotel near Victoria is just that. Built in 1851, by the present owner’s great great grandfather William Chinnery Mitchell, the Georgian House Hotel has been a family treasure for over 150 years and now Serena von der Heyde is putting her own stamp on the property. One can now understand why Winston Churchill lived a few doors away from this hotel. The hotel has a convenient location, being perfectly placed for Victoria mainline station and Underground, as well as the Victoria Coach Station. It’s an area which is enjoying lots of refurbishment, gentrification and construction. Many of these grand homes built in the 1850s were later divided into multiple-occupancy dwellings and became somewhat down at heel. These days they are all very much more elevated and sought-after. One can now understand why Winston Churchill lived a few doors away from this hotel. Over several generations the three joined houses which are now the Georgian House Hotel have been handed down through the family. Serena von der Heyde took over the bed and breakfast business in 1987, when it was just a two-star hotel with its 28 guest rooms. 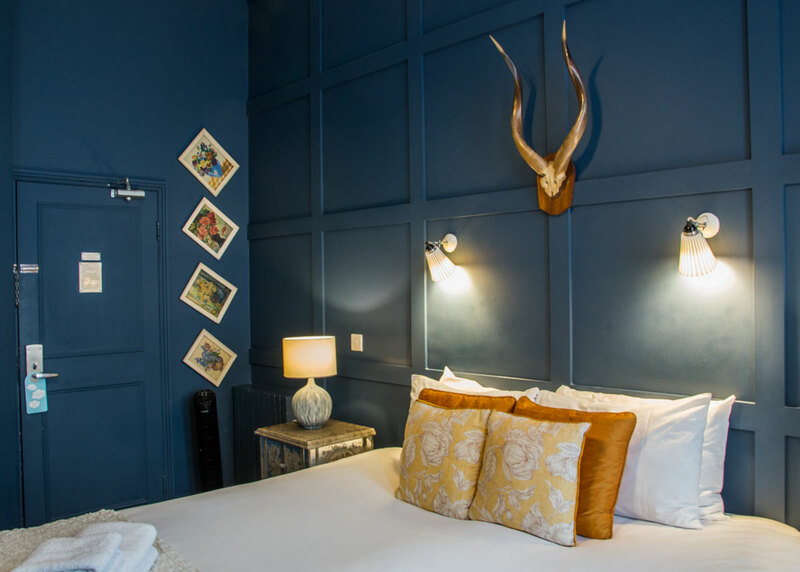 It’s taken a while but this hotel has been tastefully transformed into a five-star boutique hotel with 60 or so rooms spread over those early-Victorian buildings. The public spaces are intimate and decorated in period style but with more contemporary wallpaper and soft furnishings. Oil paintings give a nod to a rich heritage and continuity. There are sofas and chairs into which to snuggle with the Sunday papers or a Harry Potter colouring book. Yes, there is a HP connection via a secret basement hidden behind a bookcase! Kids will be begging for a stay in those Wizard Chambers. 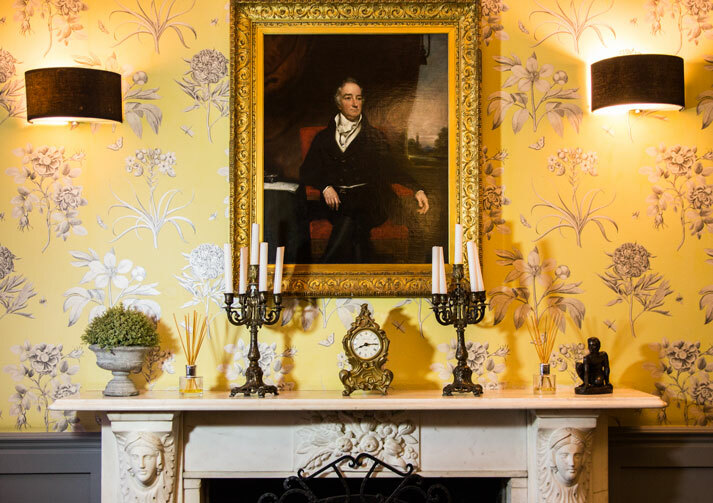 The regular guest rooms are stylishly and individually decorated, with impressive original fireplaces. There’s bold use of heritage paint colours which works perfectly with the panelled walls and high ceilings. Our room had antlers over the bed, and antique furniture. There was a touch of modernity in the guise of a retro bright yellow telephone. Many visitors will welcome the Android mobile which is free to use both inside and outside the hotel. This will be a real boon to overseas guests who have nightmares about the phone bill costing more than the trip. There are the expected amenities in the bathroom, fluffy bathrobes and slippers in the wardrobe, and coffee machine and tea on hand. Our room was comfy, warm and cosy and at a very reasonable price, too. Breakfast is taken on the basement level – in the light and airy Pimlico Pantry. There is a bench laden with fruit, yoghurt, pastries, cheeses, cold meats and breads. The menu offers freshly prepared hot dishes from a hearty Full English to lighter fare. 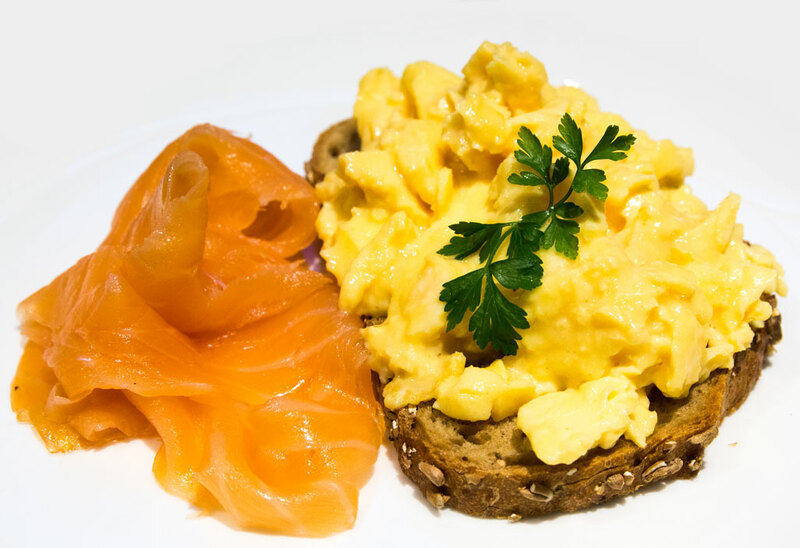 Scrambled Egg on Toast with H. Forman & Son’s celebrated Scottish smoked salmon was my choice. The eggs were cooked to still-glossy perfection with the salmon offering a rich seasoning to the substantial plate. This is a must-try breakfast for any visitor to London. H. Forman & Son have been making their London-cured fish for generations. Homemade Pimlico Pancakes took the fancy of my guest. Three buttermilk pancakes and maple syrup were joined by two slices of thick and flavoursome bacon. A marvellous start to any day when paired with numerous cups of tea. Georgian House Hotel is a real hospitality find. A 5* B&B in every regard. I’ll be recommending friends to stay there when they want a bolt-hole for a short break in London. Yes, we have a spare room chez nous, but the breakfast is much better at The Georgian House Hotel.